Large Shaped Pads are specially designed for managing moderate to heavy urinary and/or feacal incontinence with high levels of absorbency also making them appropriate for night time use. The products in this range from Lille Healthcare and Attends share common attributes which provide the user with peace of mind, comfort, security and skin integrity. Can be worn with the users own close fitting underwear or ideally using special net/stretch pants. 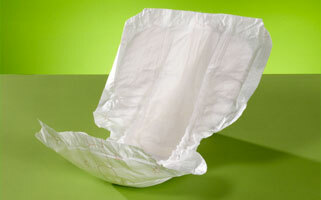 More Absorbency: Double absorbent core in the centre of the pad to optimise absorbency level. No Leakage: Hydrophobic leg cuffs prevent sideways leakage. Wetness Indicator: This will turn blue indicating when the pad should be changed for maximum comfort.